Arthur Ackland Hunt was born at Herne Bay, Kent, the eighth child of Dr Thomas Hunt and Martha Mary Colam. Hunt was a painter of landscapes and group scenes, one of his best known being 'Dr William Gilberd Showing his Experiment on Electricity to Queen Elizabeth I'. He was a member of the Royal Academy from 1865 to 1902 and also had pictures exhibited at the Royal Hibernian Academy. In 1914, the year of his death, his correspondence address was Art Club Studios, Bennet Park, Blackheath. 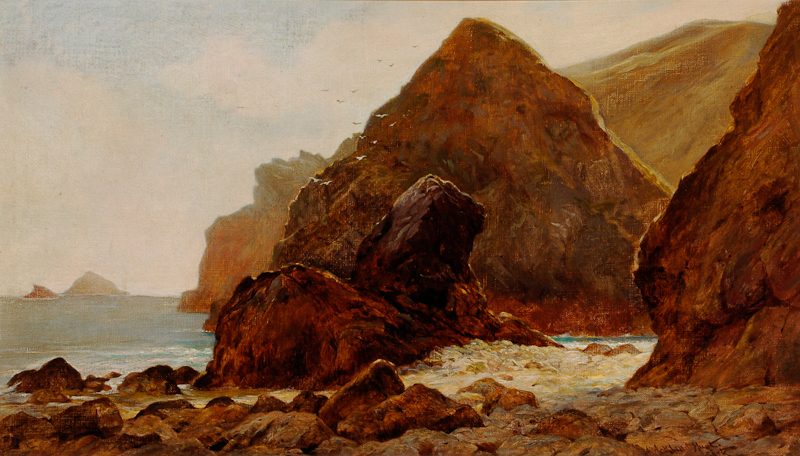 This detailed painting of the Lion Rock, Sark, illustrates Hunt's interest in describing nature in minute detail, whilst casting a romantic and atmospheric veil across the whole painting. 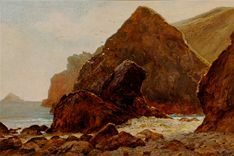 Hunt completed at least two other paintings depicting Sark scenes which were exhibited at the Royal Academy1894 (Gouliot Cliffs) and 1897 (Brechon Cliffs).